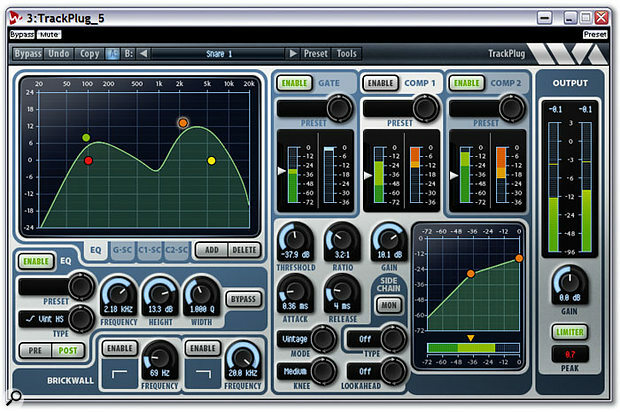 One of the Suite's five plug-ins: Trackplug combines a clean and versatile 10-band EQ with a comprehensive compressor and gate, and is already very popular around the world for its low CPU overhead. The latest incarnation of Wave Arts' plug-in suite is a treat for the eyes and the ears. Last time I looked at the Power Suite bundle of processors and effects it was up to version 4.06, but Wave Arts don't rest on their laurels, and version 5 adds a significant number of new features to the package, not least a new and more sophisticated graphic look, enhanced preset management and 192kHz support. It still comprises five plug-ins — Trackplug, Final Plug, Multi Dynamics, Masterverb and the new Panorama, which replaces the previous Wave Surround — and formats supported are VST and RTAS on Mac and PC, plus AU and MAS on the former and Direct X on the latter. Trackplug combines a clean and versatile 10-band EQ with a comprehensive compressor and gate, and is already very popular around the world for its low CPU overhead, as this often lets you run significantly more instances than many competitors. However, this time around almost every aspect of it has been improved. A new brick-wall filter is now present at the beginning of the signal chain to remove hum, thumps and hiss before further processing, and the EQ section now has 11 options for each band instead of the previous seven, adding variable-Q resonant options to the existing fixed-Q low shelf and high shelf, plus the asymmetrical transition of the vintage 'analogue' low and high shelf. Another more fundamental change is that there are now two compressors in series rather than one, each with five modes. The Clean Peak and Clean RMS modes from earlier versions offer transparent results, while the Vintage Peak and Vintage RMS modes add odd harmonics when driven hard, and Vintage Warm offers both even and odd harmonics. The comprehensive manual explains the differences well, but there's no substitute for hearing them in action — the new vintage modes offer plenty of analogue colour and warmth, and the ability to chain two compressors with different settings increases the possibilities still further. There are also new side-chain modes for more specialist compressor duties, such as de-essing using a side-chain EQ. More exotic possibilities include the twin side-chains of EQ Compare mode, so that you can, for instance, have a band-pass filter detecting sibilance, and a notch filter at the same frequency in the alternate band. The compressor then only operates when there's sibilant energy, so Trackplug doesn't mistakenly remove any other parts of your track. Experimentation is the key, but there are loads of presets on offer for each Trackplug section, to get you into the right ball park. 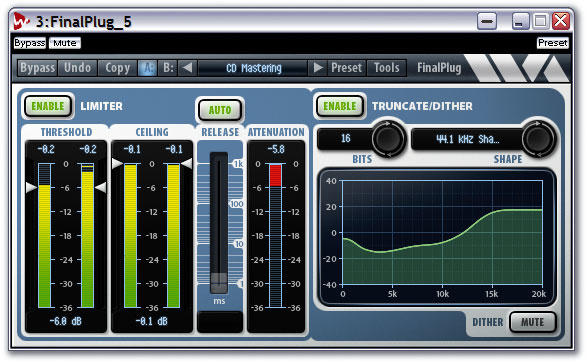 Finally, Trackplug has a new Peak Limiter on its output to help avoid nasty digital clipping. It's certainly handy, and is fairly transparent too, unless you whack up the gain. 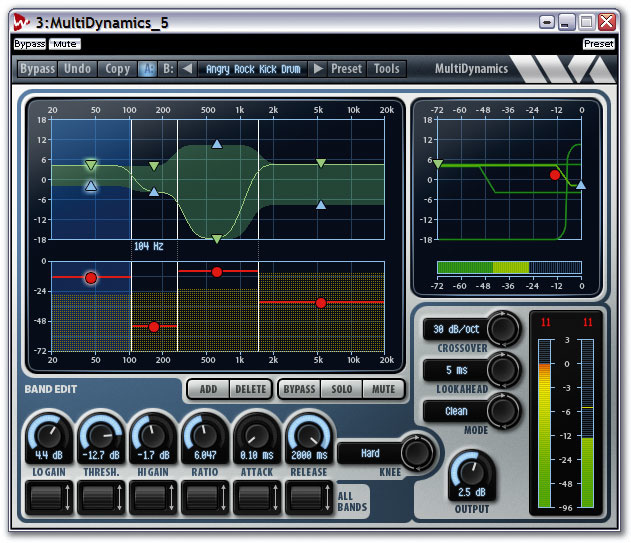 MultiDynamics.Multi Dynamics is a versatile plug-in offering up to six bands of compression or expansion/gating, and apart from the graphic makeover is essentially the same as before, except for a new Clean/Vintage compression-mode option. Vintage works like a classic analogue compressor and can, at extreme settings, create low-end fattening and transient shaping, while Clean retains the transients and avoids distortion where you require more transparency. I found the difference on some material quite profound, and overall I think the new modes are a useful and creative addition. 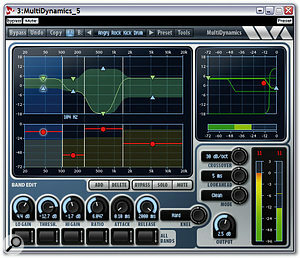 Final Plug is designed for peak limiting with optional bit-depth reduction and noise-shaped dithering, to allow you to increase the final level of a song in a transparent manner, unless you want to use it as an effect (think of Waves' L1 Ultramaximizer and you're in very similar sonic territory). Version 5 sports a new Auto Release mode, like that of Waves' L2, which will calculate the limiter's release time automatically. I could immediately hear the improvement, with significantly fewer artifacts such as pumping or distortion on some material. 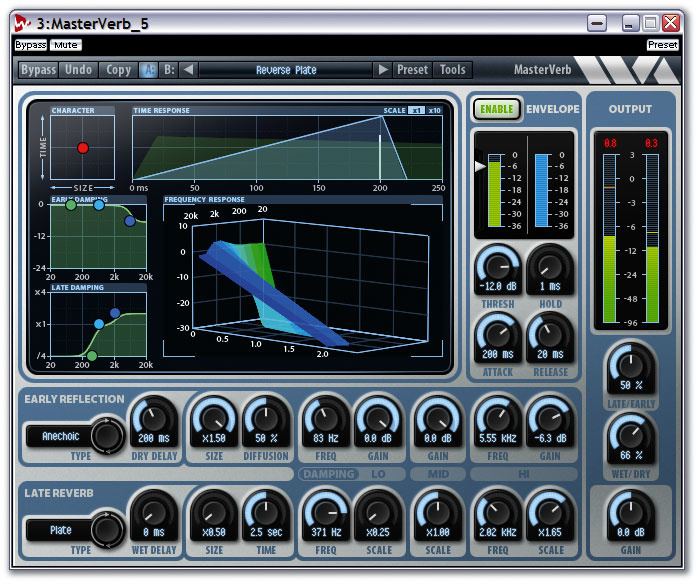 FinalPlug.When I first reviewed Masterverb, way back in SOS February 2002, I was impressed by its smooth sound and low CPU overhead; each new version since has brought a few refinements, but version 5 is the result of a major overhaul that has added a huge number of new features. There's still a draggable 'ball' to set room size (horizontal) and decay time (vertical), with the frequency response over time being displayed graphically in a 3D window, but now there's a new section devoted to early reflections. Here you can choose from 13 characteristic reflection patterns pertaining to various rooms, chambers, plates, halls, churches, and even single and ping-pong echos. Some musicians haven't yet realised how essential these can be to 'place' a sound within a space. Setting the new Late/Early mix control to '0 percent Late' allows these early components to also be used in isolation, to thicken up sounds without giving them obvious reverberation. Both early and late portions now appear in a new Time Response display, while the Late reverb algorithm now has a plate as well as a hall option, and early and late damping is now considerably more sophisticated, with three-band EQ controls. There's also a new Envelope section with classic threshold, attack, release and hold controls, so you can create gated and 'reverse' reverb. While importing Masterverb 4 presets shows that the basic hall algorithm is the same, the new Masterverb 5 preset collection offers far smoother rooms and halls, shimmering plates, huge gated drum sounds and exotic special effects. 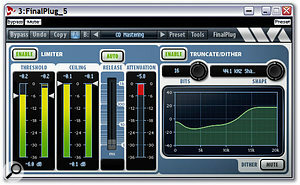 The new features have totally transformed the overall sound into something decidedly more versatile and sophisticated. Although many of us now reach for realistic convolution reverbs, Masterverb 5 's traditional algorithmic reverb sounds excellent, is much quicker to tweak, is more versatile, and used less than half the CPU overhead of any convolution reverb in my collection. Panorama.Panorama takes the previous Wave Surround plug-in to a completely new level. Still based on HRTF (Head Related Transfer Functions) and binaural synthesis, and with playback modes to suit headphones or various speaker arrangements, it once again allows the user to move the virtual speakers in the graphic window to place sounds in between the speakers, beyond them, and (on some systems) make them appear to move behind the listener, with or without optional reverb to make sounds fit into a real acoustic space. However, the new version not only gives you control over the width of your image, from mono to super-stereo, but also the power to position your sounds in 3D space, in either Polar co-ordinates (azimuth and elevation in degrees, and distance in feet or metres), or Cartesian co-ordinates (X, Y and Z, all in feet or metres). The Top (plan) view can also be switched to a rotatable 3D box view, and there's a new MIT KEMAR HRTF head model to supplement the previous 'Human' one. The reverb section has also been enhanced by a choice of room algorithms, and there's a completely new Reflections section. Once you click on that section's title bar you find a comprehensive set of extra controls that let you set the distance and material of each of the six faces of your virtual space. The most exciting aspect is that you can grab the source sound in the overhead view window and drag it around in real time between the speakers, behind them, closer and further away, and even up and down, with optional Doppler pitch processing for generating realistic motion effects. As with Wave Surround, I found the 'beyond the speakers' effects worked well, as did the new width and distance parameters, particularly with the Reflection and Reverb sections on, so that you could hear more reflected sound as it moved further away. However, for me the 'behind' positions still didn't work on either headphones or speakers, becoming impossible to pinpoint, and I also had difficulties believing the up/down of the elevation parameter — you may have more luck, though. Nevertheless, the draggable source is totally automatable, letting you record complex moves in real time, and with the Doppler mode on I began to experience motion sickness within a few seconds, particularly in speaker mode with percussion tracks. For anyone wanting to create movement in their mixes, this plug-in is great fun. Overall, Wave Arts' Power Suite 5 is a huge leap forward from previous versions, particularly in the areas of compression, reverb and spatial effects. Audio quality is on a par with most of its rivals (as you'll hear if you take advantage of the demo version downloads), processing overhead is lower than many competitors, and at $599 (about £344) it's also good value for money. If you don't need all five plug-ins you can buy any three for just $349 (£200), any two for $299 (£170), or each one individually for $199 (£115). Trackplug now has vintage-style compressor options which sound good. 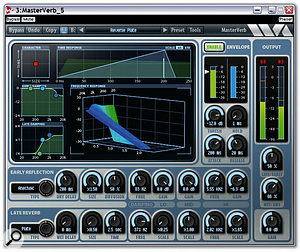 Masterverb is far more sophisticated than previous versions. Some Panorama movements may not work for everyone. Wave Arts' Power Suite 5 is the most significant upgrade yet, and adds a new level of sophistication to this already popular bundle of plug-in processors.